Since our road trip in Ireland was going to be A LOT of driving, we decided to have a city break in the middle of our week. We left Galway and headed to Kilkenny to stay for two nights. 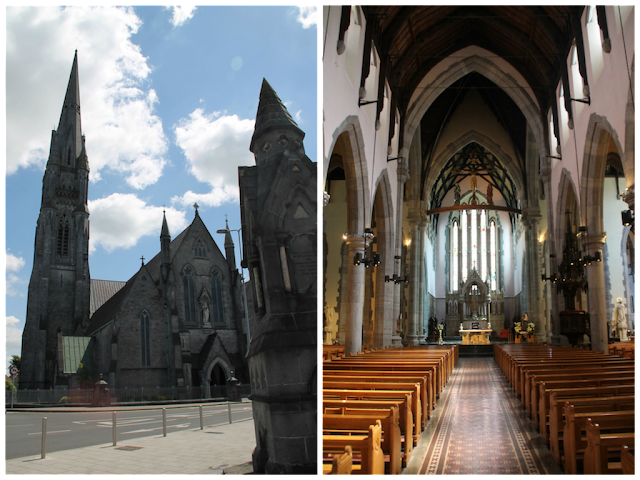 On the way, we decided to make a stop halfway to check out Limerick. We left Galway around 10:30am and arrived to Limerick around noon. We found free parking (!!!) along the river and walked a loop around the city. Right along the river lies King John's Castle. We passed by several churches on our walk. The streets were empty - it was a Tuesday, so not exactly the time for tourists to be wandering about. We did not pack a lunch for the day, so we stopped at a pub along the river to eat in the sun. We completed our walk around 2:30pm, and got back in the car. Limerick was nice, but I wouldn't say it is a place to go out of the way to visit. It was a nice break along our drive though. We had about another hour and a half drive until we reached Kilkenny, but we decided to swing through Nenagh located in Tipperary to check out a few things. There wasn't much to see, but the castle tower and courthouse were enough. Next stop was Kilkenny! We were being rushed by our AirBnB host to arrive to Kilkenny by 4:30pm... this host ended up being a lunatic... perhaps I will write about it in the next post? Anyway, while being rushed, we got stuck behind a truck full of cows for miles and miles and the smell was stuck in my nose for the rest of the day. In fact, Ireland smells like farm animals in general! Munster, the home rugby team of Limerick, is the only Irish team to have beaten the New Zealand All Blacks.